Oh, my. 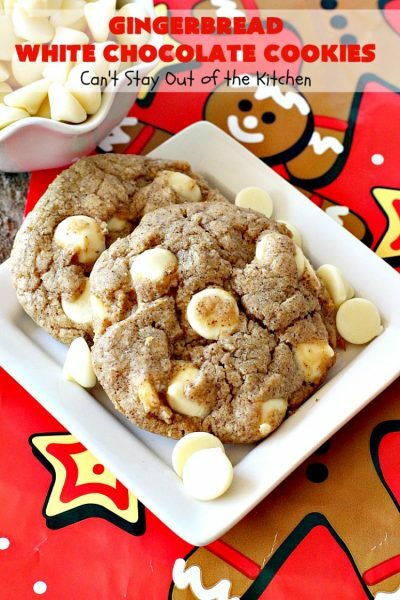 Gingerbread with white chocolate, yay! 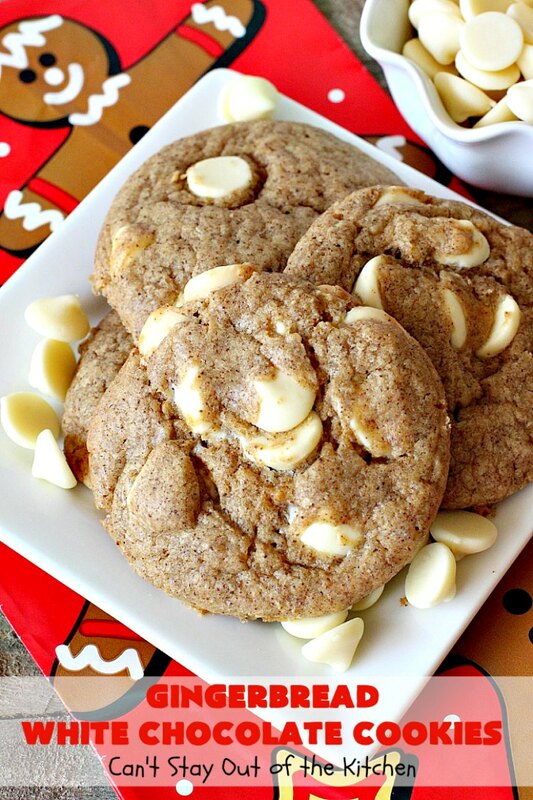 These Gingerbread White Chocolate Cookies are so delectable. Plus, they’re made with only five ingredients. They’re incredibly easy to make. If you want easy, simple, quick and delicious, this recipe is for you! Okay, let me just say up front that I love a good gingerbread. I really love the tiny, miniature Gingerbread muffins from Jason’s Deli. Yes, I could eat 20 or 30 of them in one sitting and be as content as could be. I’ve never found a super terrific recipe for gingerbread though. I would prefer a dense recipe like those muffins from Jason’s Deli, rather than a cakey, airy recipe. So if any of you out there have a gingerbread recipe you don’t mind sharing with me, please let me know!!! 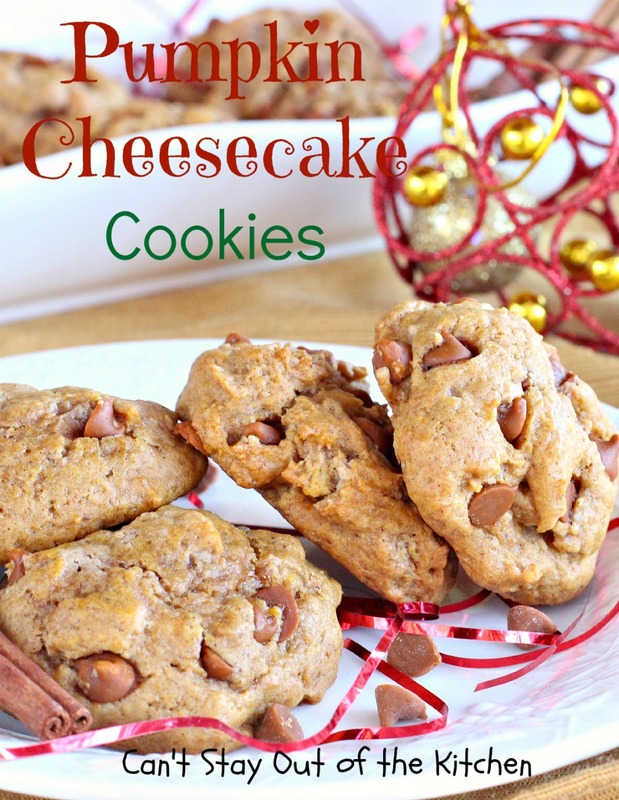 I was looking for a super easy recipe to make for our Christmas Cookie Extravaganza this year. My husband was out grocery shopping and I asked him to look for any kind of cake mix that was not the usual stuff. I wanted to make something different. When he found one that was for Gingerbread, I said I’d take eight boxes! This box was two ounces short of the normal amount of mix in cake mixes. So along with eggs, canola oil and white chocolate chips, I added a little bit of flour to make up the difference. The result was perfect. I didn’t want a runny cookie. These cookies held their shape really well. And did I say they taste great??? 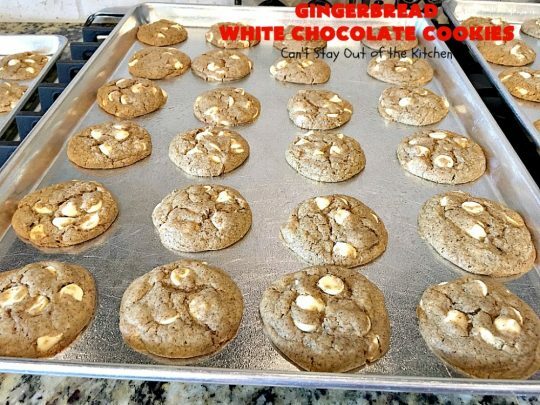 Be sure to find REAL white chocolate chips when you make this recipe. Not vanilla chips. Not premiere white baking chips. The only place in the Dallas Metroplex that carries white chocolate chips is Kroger and Trader Joe’s. Perhaps in your locale they are easier to locate. 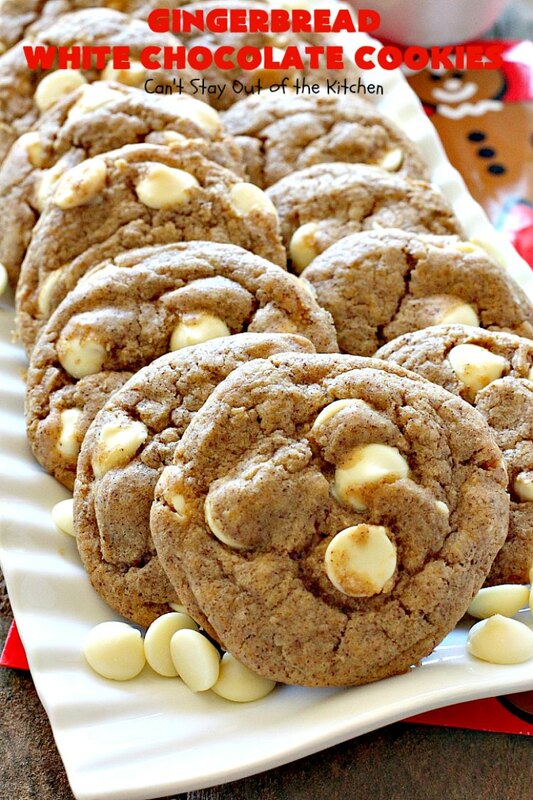 Gingerbread White Chocolate Cookies are perfect for the holidays! White chocolate and gingerbread are terrific together in this cookie. 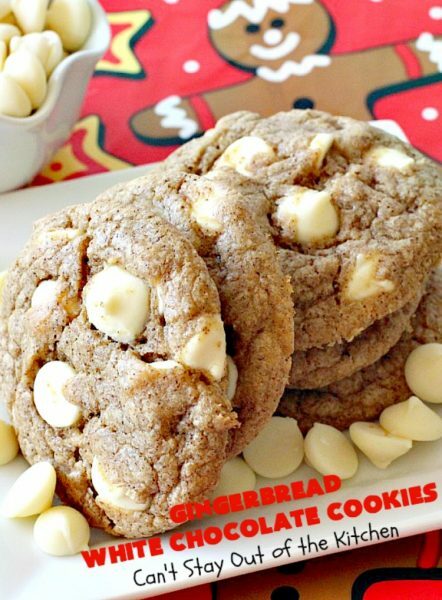 Gingerbread White Chocolate Cookies are perfect for Christmas Cookie Exchanges or any party during the holidays. I used these ingredients plus unbleached flour. 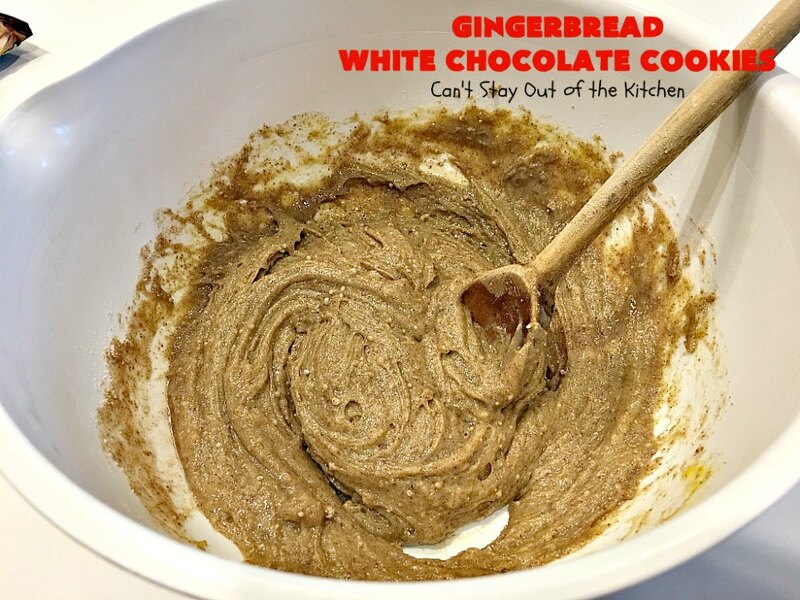 Pour gingerbread cake mix into a mixing bowl. Add eggs and canola oil. I would also add the flour now. Stir ingredients to combine. Because my mixture was too gooey, I added flour at this point. It made a big difference. The cookies weren’t runny that way. Gingerbread cake mixes have two ounces less than most cake mixes so the cake mix didn’t have the volume necessary, and needed a little flour to compensate. Roll mixture into balls and place on greased cookie sheets. Bake at 350 about 13-15 minutes or until done. I was baking 4 racks at once with 24 cookies on each sheet, so my cookies took about 20-24 minutes to bake. Here they are, ready to pack up for our Christmas Cookie Extravaganza. Gingerbread White Chocolate Cookies are so easy to make. 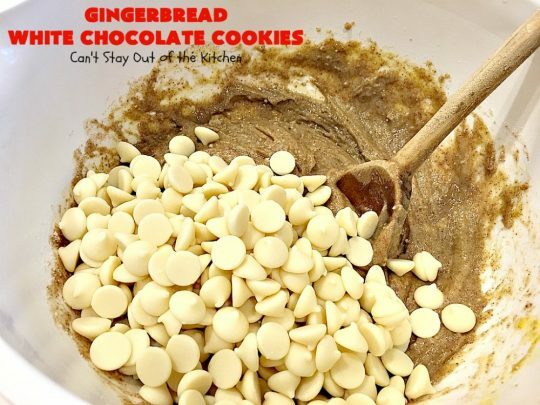 Even kids can make these simple cookies! 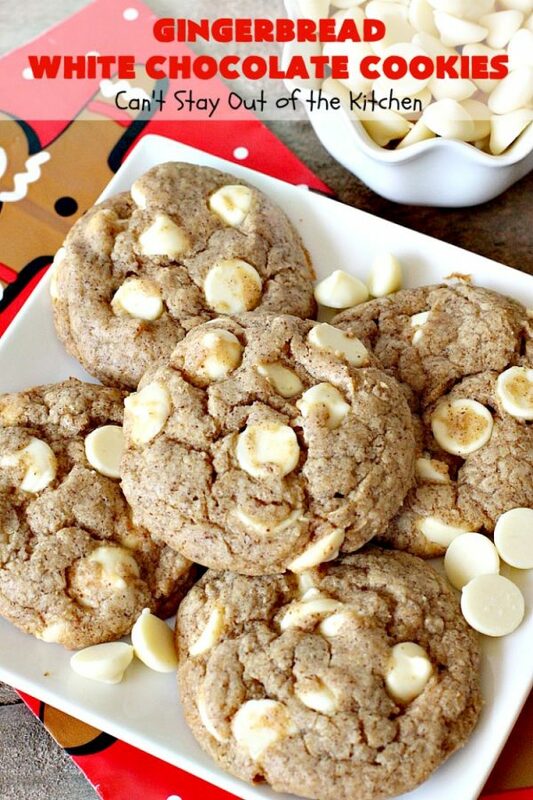 Every cookie is loaded with white chocolate chips. Yum. If you’re looking for a marvelous cookie for your holiday baking, consider making some of these amazing cookies. 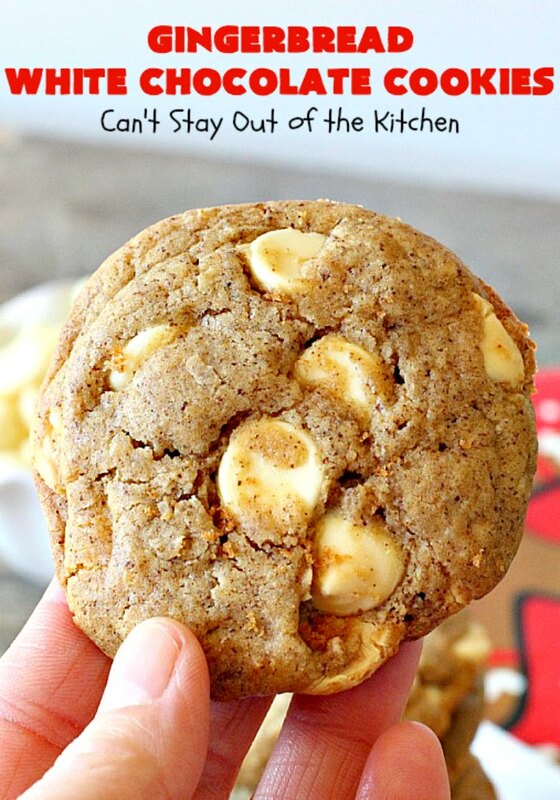 These fabulous cookies are so quick and easy because they use only 5 ingredients! They're perfect for Christmas cookie exchanges, holiday parties and fall baking. 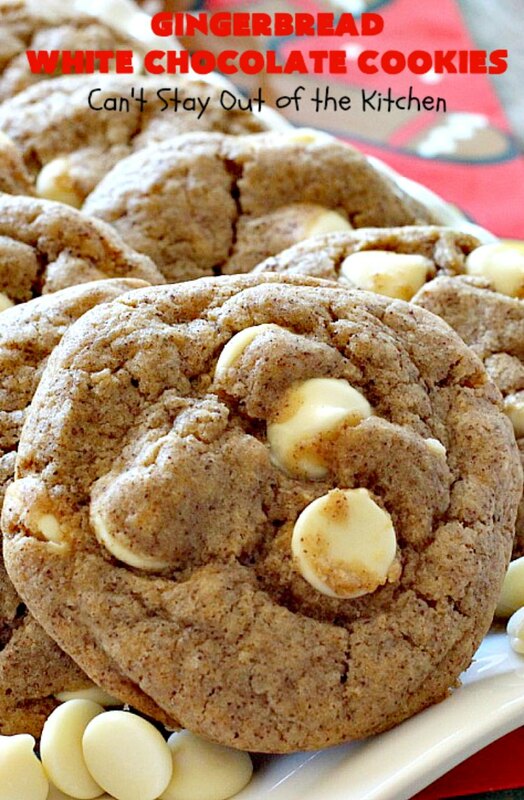 Gingerbread cake mix and white chocolate chips make these cookies heavenly. Combine cake mix, flour and eggs. Stir in oil just until batter is moistened. 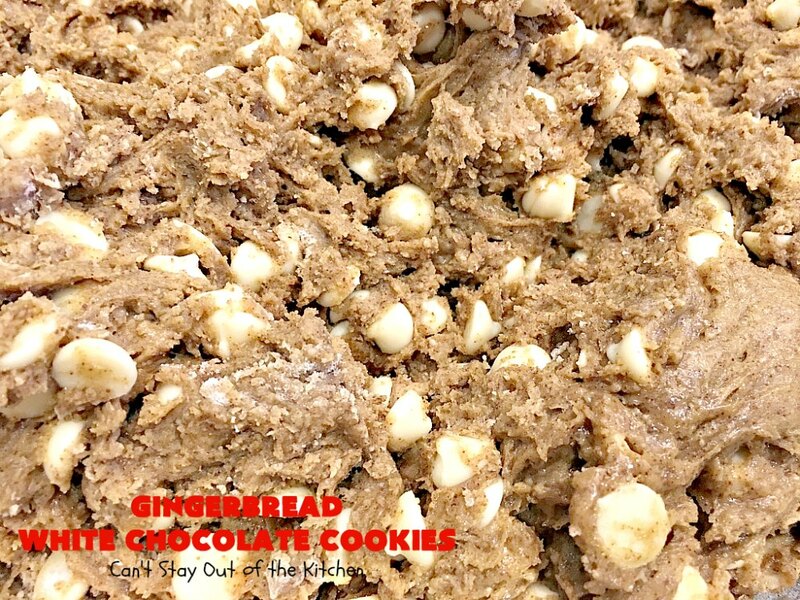 Roll cookies into balls or scoop cookie dough with a scoop and place on prepared baking sheets. Bake at 350° for 13-15 minutes or until done. NOTE: Because I was baking 24 cookies per cookie sheet and four racks of cookies at once, my cookies took about 28-30 minutes to bake. I also rotated the trays every eight minutes. NOTE: These cookies must be rotated during baking or the white chocolate chips will brown on the top rack. NOTE: I found these cookies did better by rolling the dough into balls than using a cookie scoop. 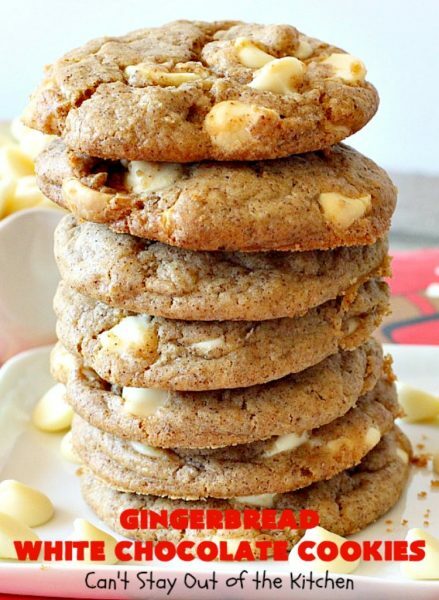 NOTE: Be sure to use true white chocolate chips. Most stores only carry white or vanilla chips. They are not the same. In the Dallas area the only two stores that carry white chocolate chips are Kroger and Trader Joe’s. NOTE: Because the gingerbread cake mixes are two-ounces less than most cake mixes, I added flour to get the cookie dough to the correct consistency. Gingerbread White Chocolate Cookies are sure to satisfy any sweet tooth craving. 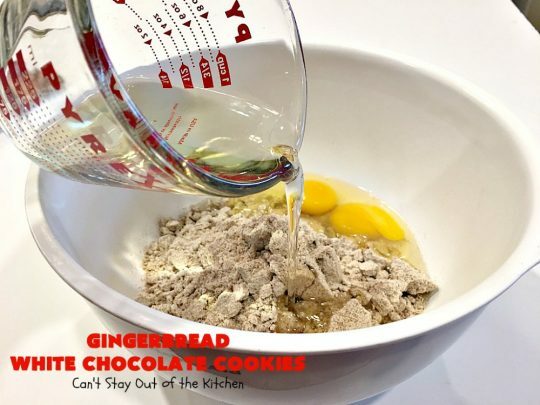 Can I use gingerbread cookie mix instead? I think that would work, Nina. The biggest thing is to check the amount of ounces on the box. If it’s less ounces (like a 15ounce box instead of 17ounces) then you need to add an additional 2 ounces of flour to make up the difference. Otherwise there will be too much oil and the cookies will flatten out too much. I didnt see the gingerbread at our grocery store, so I bought the Spice cake mix which is 15.25oz. Would I still need to add flour to it? I would Sasha, so that you have about 17 ounces weight. I hope it works out well for you. 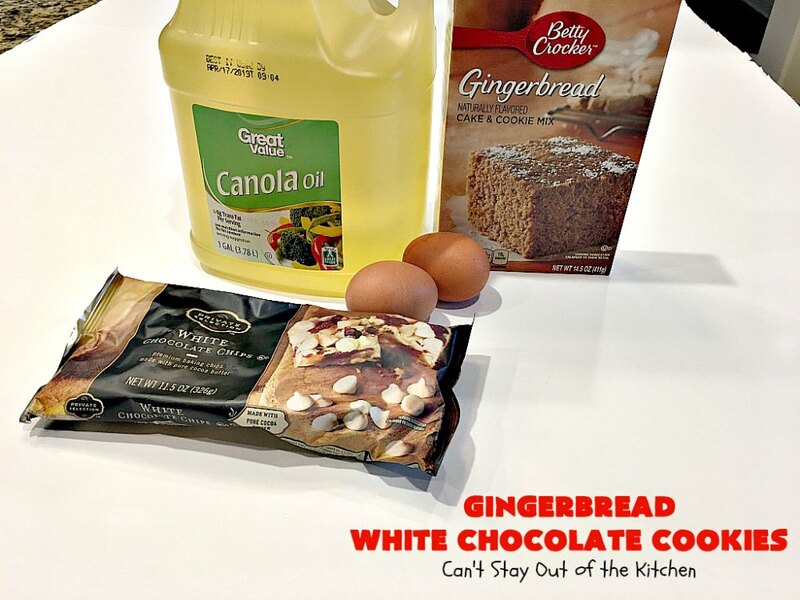 If you don’t want to add the flour you will have to cut down on the oil mixture or the cookies will run flat. Hi, Ray. I don’t think I’d substitute butter for oil in this recipe because I don’t think the grains of cake mix will absorb the same way as with oil. However, if you want a healthier oil, you can substitute avocado oil. Awesome! Looking forward making these! YUM. I live in Oregon and Fred Meyer carries the same ingredients as you show in the picture. Thanks, Mona. These really were pretty easy to make. 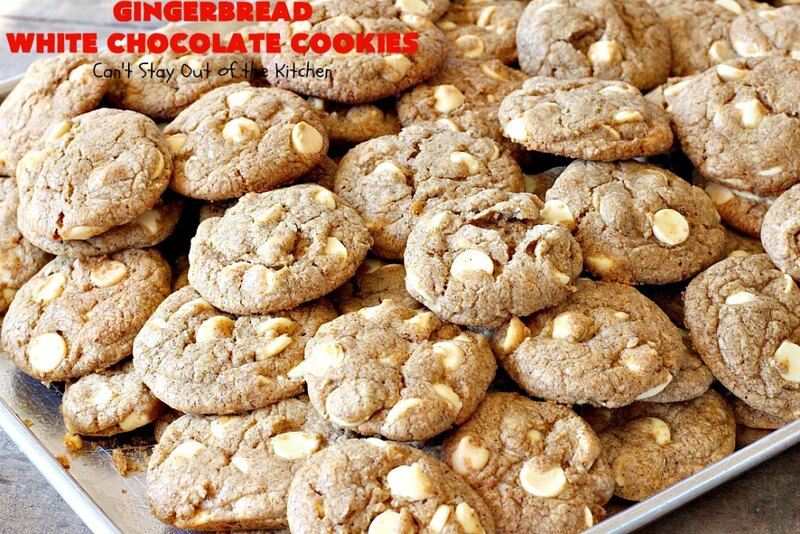 The trick is making sure you don’t add too much oil so the cookies don’t flatten out too much while baking.